Stochastic Gradient Descent is an important and widely used algorithm in machine learning. In this post you will discover how to use Stochastic Gradient Descent to learn the coefficients for a simple linear regression model by minimizing the error on a training dataset. The form of the Simple Linear Regression model. How to use stochastic gradient descent to learn a simple linear regression model. Photo by Stig Nygaard, some rights reserved. The data set we are using is completely made up. Here is the raw data. The attribute x is the input variable and y is the output variable that we are trying to predict. If we got more data, we would only have x values and we would be interested in predicting y values. Below is a simple scatter plot of x versus y. We can see the relationship between x and y looks kind-of linear. As in, we could probably draw a line somewhere diagonally from the bottom left of the plot to the top right to generally describe the relationship between the data. This is a good indication that using linear regression might be appropriate for this little dataset. When we have a single in put attribute (x) and we want to use linear regression, this is called simple linear regression. This is a line where y is the output variable we want to predict, x is the input variable we know and B0 and B1 are coefficients we need to estimate. B0 is called the intercept because it determines where the line intercepts the y axis. In machine learning we can call this the bias, because it is added to offset all predictions that we make. The B1 term is called the slope because it defines the slope of the line or how x translates into a y value before we add our bias. The model is called Simple Linear Regression because there is only one input variable (x). If there were more input variables (e.g. x1, x2, etc.) then this would be called multiple regression. Gradient Descent is the process of minimizing a function by following the gradients of the cost function. This involves knowing the form of the cost as well as the derivative so that from a given point you know the gradient and can move in that direction, e.g. downhill towards the minimum value. In Machine learning we can use a similar technique called stochastic gradient descent to minimize the error of a model on our training data. The way this works is that each training instance is shown to the model one at a time. The model makes a prediction for a training instance, the error is calculated and the model is updated in order to reduce the error for the next prediction. Where w is the coefficient or weight being optimized, alpha is a learning rate that you must configure (e.g. 0.1) and gradient is the error for the model on the training data attributed to the weight. The coefficients used in simple linear regression can be found using stochastic gradient descent. Linear regression is a linear system and the coefficients can be calculated analytically using linear algebra. Stochastic gradient descent is not used to calculate the coefficients for linear regression in practice (in most cases). Linear regression does provide a useful exercise for learning stochastic gradient descent which is an important algorithm used for minimizing cost functions by machine learning algorithms. Let’s start with values of 0.0 for both coefficients. Where p(i) is the prediction for the i’th instance in our dataset and y(i) is the i’th output variable for the instance in the dataset. We can now use this error in our equation for gradient descent to update the weights. We will start with updating the intercept first, because it is easier. Where B1(t+1) is the update coefficient, B1(t) is the current version of the coefficient, alpha is the same learning rate described above, error is the same error calculated above and x is the input value. We have just finished the first iteration of gradient descent and we have updated our weights to be B0=0.01 and B1=0.01. This process must be repeated for the remaining 4 instances from our dataset. One pass through the training dataset is called an epoch. You can repeat this process another 19 times. This is 4 complete epochs of the training data being exposed to the model and updating the coefficients. I think that 20 iterations or 4 epochs is a nice round number and a good place to stop. You could keep going if you wanted. Your values should match closely, but may have minor differences due to different spreadsheet programs and different precisions. You can plug each pair of coefficients back into the simple linear regression equation. This is useful because we can calculate a prediction for each training instance and in turn calculate the error. Below is a plot of the error for each set of coefficients as the learning process unfolded. This is a useful graph as it shows us that error was decreasing with each iteration and starting to bounce around a bit towards the end. Let’s plug them into our simple linear Regression model and make a prediction for each point in our training dataset. We can plot our dataset again with these predictions overlaid (x vs y and x vs prediction). Drawing a line through the 5 predictions gives us an idea of how well the model fits the training data. In this post you discovered the simple linear regression model and how to train it using stochastic gradient descent. You work through the application of the update rule for gradient descent. You also learned how to make predictions with a learned linear regression model. Do you have any questions about this post or about simple linear regression with stochastic gradient descent? Leave a comment and ask your question and I will do my best to answer it. God Bless you and your family . Your duties was every bright so keep it up. My loard jesus bless your mind and your duties. I don’t have more words. u explain it very well. thank you so much. Thanks for your kind words effa. I’m glad you found the post useful. I am getting somewhat confused between epoch and iteration.Is epoch or iteration depends on number of observations in training dataset? I am having dataset as (year,cost)= [(2005,40.15), (2006,49.8), (2007,60), (2008,75), (2009,83), (2010,90), (2011,111), (2012,128). (2013,128), (2014,138), (2015,160),(2016,175) and I want to apply linear regression with stochastic gradient descent.what epoch or iteration should i set? One epoch is one run through the entire training dataset. An iteration may be an epoch or it may be an update for one training observation (one row in the training data), depending on the context (training iteration vs update iteration). Hi Jason, i am investgating stochastic gradient descent for logistic regression with more than 1 response variable and am struggling. I’m not sure what you mean Serb. There is no “m” in the above equations. in order to determine the parameters B0 and B1 it is necessary to minimize this function using a gradient descent and find partial derivatives of the cost function with respect to B0 and B1. At the end you get equations for B0 and B1 where there is “m”. B0 representing the slope of our to-be regression line and B1 the intercept. Can you explain if this is incorrect or what I’ve mistaken? 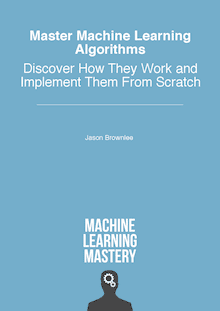 The update equations used in this post are based on those presented in the textbook “Artificial Intelligence A Modern Approach”, section 18.6.1 Univariate linear regression on Page 718. See this reference for the derivation. I cannot speak for the equations in the youtube video. I believe you might be mixing up stochastic and batch gradient descend. In batch gradient descend you calculate the total error for all the examples and divide it by the number of examples for a ‘mean error’. On the other hand, in stochastic gradient descend, as in this article, you tackle one example at a time, so no need to calculate a mean by diving with the number of examples. Actually the m isn’t necessary. It all depends upon the learning rate chosen the whole thing (alpha / m) may be regarded as a single constant. The point is, the learning rate is all the matters, the m is just another constant. Can you make a similar post on logistic regression where we could get to actually see some interations of the gradient descent? Remember to use the updated values from the last iteration as the starting values on the current iteration. Hi, what is the convergence point? How we understand that is the minimum point of the function? You stopped calculation with B0=0.230897491 and B1=0.7904386102. And then calculated predicted values. Can you please explain why it stopped on this B0 B1 values? It should be error=0? How we see it? Thank you! You can evaluate the coefficients after each update to get an idea of the model error. You can then use the model error to determine when to stop updating the model, such as when the error levels out and stops decreasing. 1 – the error you plotted is the model error (computed by evaluating the coefficients and comparing to the correct values) right? 2 – we often see graphs plotting error vs iteration with the error decreasing over time (http://i42.tinypic.com/dvmt6o.png); is error in your graph just plotted on a different scale? or why do most training graphs have error decreasing from a positive number to zero? Would really appreciate some clarification, and thanks again for the tutorial! The error is calculated on the data and how many mistakes the model made when making predictions. Thanks a lot for such a nice post, I have doubt in calculation of y coordinate using B0 and B1 value. Acc. to me we are using y=B0+B1*x (to calculate y predicted), but considering B0=0.230897491 and B1=0.7904386102, answer of first instance(x=1,y=1) should be y(predicted)=1.0213361012 as (y=(0.230897491)+(0.7904386102)*1), but in your post it is 0.9551001992., so am I doing something wrong or intercepted it wrongly? Guide me if I am missing somewhere? I am stuck at same question. How can I find the value of theta 0 and theta 1 with the given training set(x,y)..so that linear regression will be able to fit the data perfectly..? Rarely do models fit the data perfectly unless the data was contrived. Using a linalg approach will give a more robust estimate if the data can fit into memory. A model is a tradeoff. Is SGD the same as backpropagation? When classifying images into two categories (e.g. Cats and Dogs) is the model computing linear regression. If not, what would this be classified as? No, gradient descent is a search algorithm, backpropagation is a way of estimating error in a neural net. Hi Dr. Brownlee: Definitely a great tutorial! I was able to reproduce the same results. Can this algorithm be modified for multiple parameters? I am trying to understand linear regression for more than one parameter and the tutorials I have found use excel or some other tool the black boxes the actual algorithm. Yes, linear regression can have multiple inputs. Did I miss the derivative here? I do not cover the derivation. I have read the post, but I am not very clear about the difference between Gradient Descent and Stochastic Gradient Descent in this particular example. You have shown that in Stochastic Gradient Descent, we take one example at a time and update the coefficients. But what happens in case of Gradient Descent? hi sir, im maruthi please let tell me step by step procedure.As a fresher i understand 50% only. Why do you choose not to square the sum of distances in the loss function? In my class we did everything similar to what you outlined except that part in order to make the function differentiable. For the value of b0=0.01 b1=0.01 the corresponding values of x and y are 1. When we put those in the linear equation we get y_predict=0.01+0.01*1 I am not getting 0.95 as the first value. Am i doing something wrong? how can should i decide the learning rate for my model , any suggestion. when i am applying the B0 and B1 value to the linear regression, i am getting a different predicted value. can u just rectify my doubt? Perhaps your coefficients differ from the tutorial? Thanks for the post. It is very pedagogical. I wonder about implementing the Gradient Descent with Mini Batches for your example. When updating the B1, what would be the value of x to be iput in your equation B1(t+1) = B1(t) – alpha * error * x ? Still on the mini batch example, will the error to be input in both B0 and B1 equations equal to the square root of the sum of the squared error ? When using a batch, the values are averaged over all examples in the batch/mini-batch. It is the function by which we estimate the error of the model, and seek to minimize over training.